It’s the time of year when many of us start thinking about holiday baking and cooking. Whether it’s roasting a turkey with all the trimmings for Thanksgiving dinner or batches of cookies and other baked goods to share with loved ones, butter is often a key ingredient in our favorite recipes. Butter is made by churning—or stirring—milk or cream until it reaches a semisolid state and is separated from buttermilk. By law, butter must be at least 80 percent butterfat. According to the U.S. Department of Agriculture’s (USDA) Economic Research Service (ERS), each person in the United States consumed about 5.7 pounds of butter in 2016. 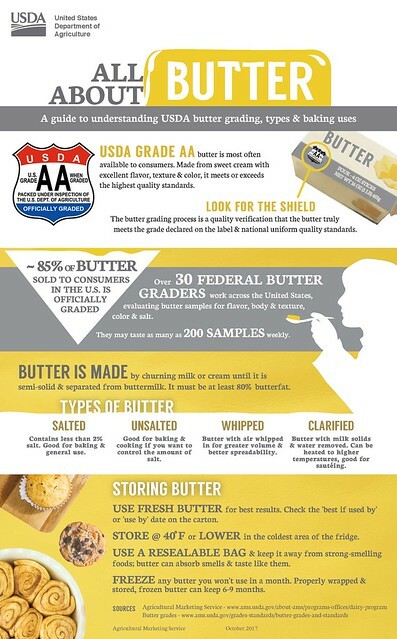 Today, USDA’s Agricultural Marketing Service is releasing a new infographic that gives you a snapshot about butter grading, types and uses. 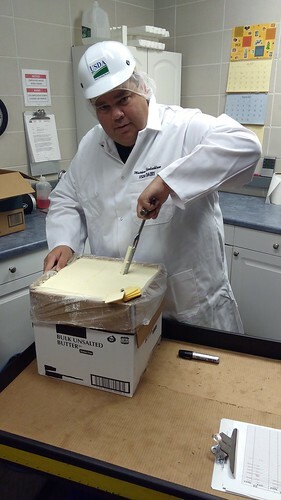 For example, did you know that there are 30 USDA butter graders across the country who typically taste about 200 samples of butter each week to ensure the quality of this dairy product, which USDA has graded since 1919. So, if you plan to use butter in your recipes, this infographic will give you a quick look at the various types of butter—salted, unsalted, whipped and clarified—and suggest how best to store butter until you need it. How come butter in Ireland and Scotland is "so much more flavorful, creamier and has better texture" than most of the butter we get access to in our stores. Grass fed cows or what??? Wow, very informative and useful for the start of the holiday baking season. Why do so many butters add oil to their products? Most have mono and Di-glycerides.